i like her and i love the basket in the front. it will definitely come in handy. have fun and be careful! What an adorable bike, I love it! And I can't wait to hear her name. =) Bikes are fun, no? I test rode that very same bike, also after not having ridden a bike in a decade. Also harrowing. I lost a flip-flop in the middle of an intersection. :) It's super cute; have fun! Oh, she is soooo adorable! Congrats on the new bike! And being on your tiptoes is actually kind of a good thing. You don't want your bike to be too small or else you'll ruin your knees -- your legs should fully extend when you down-pedal. I gotta say, though... You have WAY more guts than me. I won't even ride my bike in downtown Portland! Amazing! I hear you about biking in NYC though. I fear for my life. Haha congrats on the new ride, Alice! I like the style of it. Oh gosh...I'm not so sure I'd be brave enough to try riding a bike in manhattan, even with some practise. 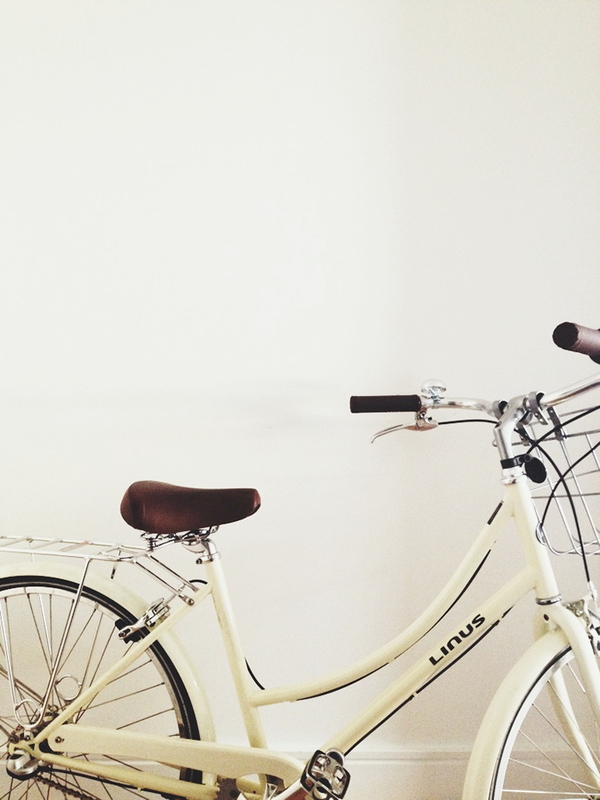 But your bike is so wonderfully cute. It must be fun deciding what to put in the basket. Congratulations :) I'm a big coward when it comes to cycling, but so far it's the best way of commuting. At first I think I was cycling slower than some pedestrians walk, but now I'm decent enough. So I'm sure very soon you will be queen of the NY streets. That is the prettiest bike I have ever seen! I haven't been on one in years - pretty sure I would be falling off too :) I love your blog by the way! the bike is lovely. good luck with getting more confident with it! I'm not sure I even learned to ride properly but it seems like fun. The hubs is mad about cycling whereas I'm always a nervous wreck when I'm on top of one. Same reason as yours. My legs are too short and I'm pedaling on my tippy toes. Beautiful bicycle!!! I know what you mean ... I rode a bike last summer for the first time since I don't know when. I felt so uncoordinated and awkward. But I got the hang of it quickly. It was at the beach before it got crowded, so riding in the street wasn't an issue. And we rode without helmets! So daring, am I. Love love love. I've had a bike on my wishlist all year. A goal for 2013! I'm in the same boat as you. Rode a bike ONCE in the past decade. West Side Highway it is :) And hideous helmets all the way.